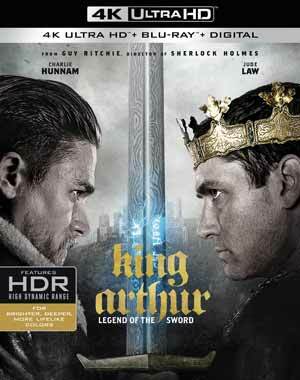 Plot Synopsis: When his father, King Uther (ERIC BANA), is murdered and his uncle Vortigern (JUDE LAW) seizes the crown, Arthur (CHARLE HUNNMAN) is robbed of his birthright. Raised in a brothel and controlling the streets with brute force and a band of loyal friends, his true past comes to light after the sword Excalibur reveals itself and the king sends out his guards in search of men of the right age as the heir to the thrown is the only one who can remove and wield the sword. 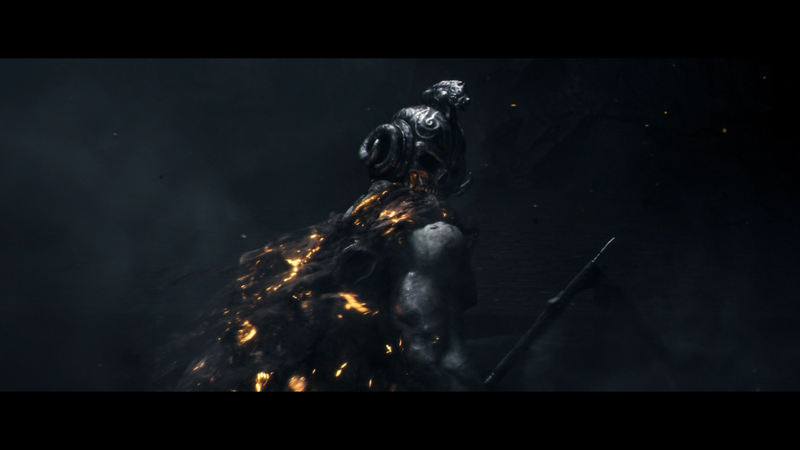 As his existence is revealed, Arthur is rescued from execution by a group of rebels, led way by Bedivere (DJIMON HOUNSOU), as they must not only convince Arthur to lay claim to his rightful place, but also train him to battle his cruel and power-hungry uncle and thus, the downtrodden people of the kingdom. 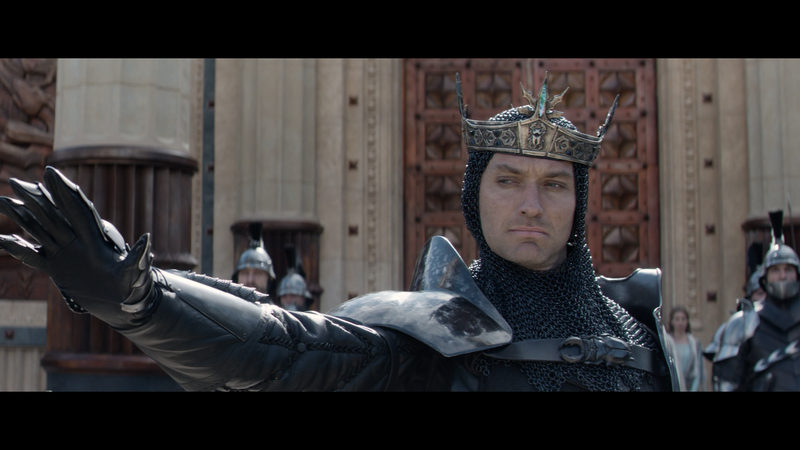 Review: The story of King Arthur has been done ad nauseam for dating back over 100 years ago in media and the character portrayed by a variety of well known actors like, at least in the last couple decades, Sean Connery (First Knight, 1995), Pierce Brosnan (Quest for Camelot, 1998) and Clive Owen (King Arthur, 2004), the latter starring in one of the bigger budget versions, produced by Jerry Bruckheimer, and which was a rather ho-hum film in itself, although, frankly, I’d rank it above this latest incarnation, King Arthur: Legend of the Sword from Guy Ritchie who co-wrote and helmed, giving it his own touch to the legend. This version isn’t terrible but in spite of having Ritchie-isms (slo-mo, camera angles, etc), there honestly not very much that’s really memorable. Charlie Hunnam might’ve been fine on Sons of Anarchy but the guy doesn’t have a whole lot of charisma to play Arthur, hell I’d argue Clive Owen had more charm and that’s saying something. The supporting cast is alright but mostly wasted from Eric Bana’s little screen time to Jude Law who isn’t very convincing as the antagonist. Then you get Djimon Hounsou whom I really like yet doesn’t get to a whole lot and Aidan Gillen is merely there since he looks good in medieval garb I guess. Even Astrio Berges-Frisbey, whom could be an up-and-comer, and perhaps was more memorable since she has mystical powers, appeared to be bored more than anything. Beyond the ho-hum performances, Ritchie’s style, which I generally enjoyed in his two Sherlock Holmes movies, seems way out of place adding in a soundtrack that didn’t feel right, though to me those songs on their own were fine. This isn’t to say the Arthurian story couldn’t have splashes of modernism in terms of style, it’s been done numerous times with plenty of Shakespeare’s works, but here it never quite gelled. If you want to see modernism done right, I’d point to A Knight’s Tale, a personal favorite of mine since I first saw it in theaters. This release comes with a semi-glossy slip cover. Inside contains a Blu-ray Copy and redemption code for the Digital HD copy. There’s actually a fair amount of features (totaling 76 minutes) included and have behind-the-scenes footage and on-set interviews from members of the cast and crew. Arthur with Swagger (9:41; HD) looks at the latest adaptation of the legendary character and the casting of Charlie Hunnam in the title role. Sword from the Stone (18:49; HD) centers on the Arthurian legend that is near and dear to the hearts of the cast and crew. Parry and Bleed (5:44; HD) looks at the sword and fight training that went into the production. Building on the Past (14:00; HD) – Here we get a look at the production design bringing the time period to life. 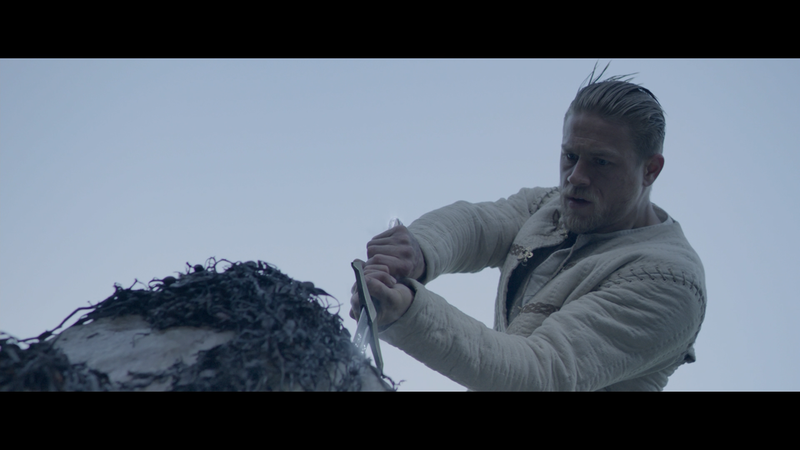 Inside the Cut: The Action of King Arthur (6:08; HD) focuses on the action center pieces from the movie. Camelot in 93 Days (10:23; HD) is on the production in about three months. Legend of Excalibur (6:05; HD) checks out the creation and design of the renowned sword. Scenic Scotland (5:33; HD) is about filming in the beautiful and photographic country. 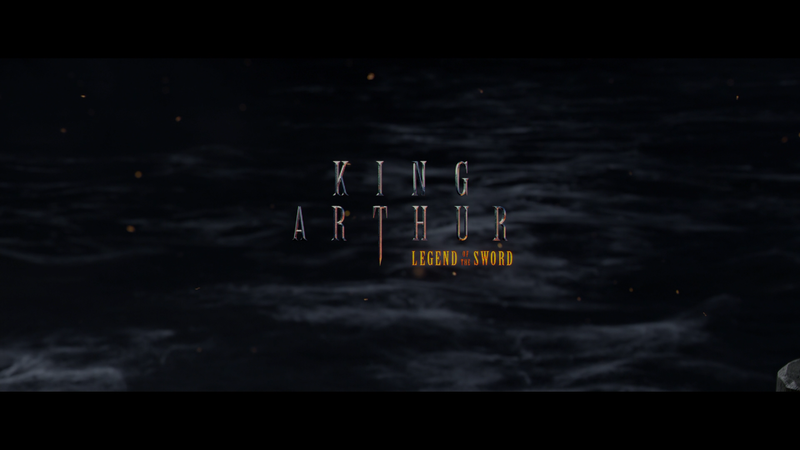 Warner Brothers releases King Arthur: Legend of the Sword onto 4K and is presented in its original theatrical 2.40 widescreen aspect ratio and given a 2160p ultra high-definition transfer (HEVC / H.265 codec). Although this isn’t a bad looking flick in 4K with some bright colors courtesy of the HDR, and skin tones were natural in appearance, some detail did look a bit soft though some of the close-ups were relatively sharp. Still, it is clean as I didn’t notice any instances of banding, artifacts or other flaws. The Blu-ray meanwhile and its 1080p high-definition transfer also look good. It does share some of the same softness of its 4K counterpart, but colors are still rather bright and some shots were at least sharp. Both the 4K and Blu-ray discs come accompanied with Dolby Atmos tracks (outputs TrueHD 7.1 for older systems) and this does boast a fantastic soundtrack. There’s a fairly wide range here from bombastic action sequences, especially the opening battle, to some of the more reflective scenes with dialogue and such. The music, as well as score from Daniel Pemberton, makes nice usage of the front and, particularly, rear channels. 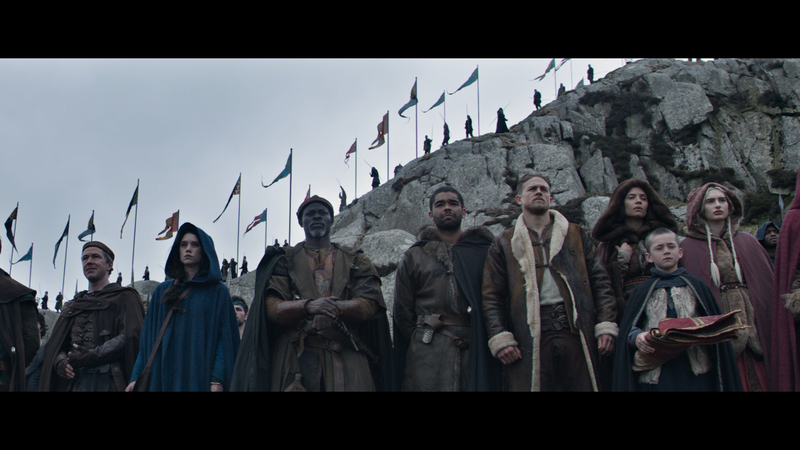 Overall, King Arthur: Legend of the Sword actually isn’t a terrible movie and yet, a couple problems: 1. There really is a need for yet another adaptation, even one that incorporates more mystical elements, 2. Guy Ritchie’s style doesn’t quite gel with the material and 3. Charlie Hunnam doesn’t nearly have enough charisma to carry this movie or play an iconic character like Arthur. As for this 4K/Blu-ray release, there’s a nice selection of bonus features and although the picture could’ve been a bit better, the transfers are still well done.